Syos have done something brilliant. They have codified a process that can usher saxophonists towards realizing the sound they desire. For me, the result has been nothing short of relief and profound gratitude. I now have a mouthpiece that meets all of my tonal needs and desires without requiring unnecessary effort. It’s a beautiful (orange) thing! The sound of Jason Moore is dark and very powerful. The mouthpiece we created for Jason gives him the possibility to deploy easily this timbre in all the registers of the tenor. 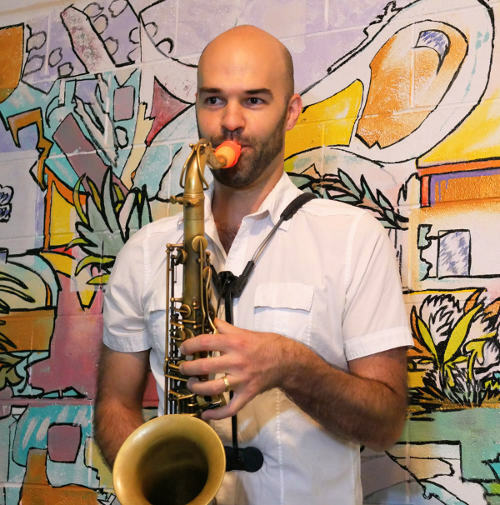 Jason James Moore is an American saxophonist, composer and educator. He performs with soul/r&b group, King Garbage as well as his own projects MPH, expansion.control, and Mutual Feels. Jason began playing saxophone at age eleven and has been studying since. He went on to graduate from Louisiana State University where he studied classical saxophone with Dr. Griffin Campbell, and later the University of New Orleans where he studied Jazz with Ed Petersen, Brian Seeger and Victor Atkins III. Following his graduate studies, Jason moved to the beautiful mountains of Asheville, NC where he now resides. Always striving for growth, he has studied under the mentorship and collaboration of Matt Otto for over six years. In 2018, Jason will launch an online saxophone education platform and publish the first of a series books with Otto.